On 18 August 2015, the Oil and Gas Authority, (OGA,) released details of new onshore oil and gas licences issued under the UK government’s 14th onshore licensing round. See map of licences further down this page. The OGA divided the licences into two groups. 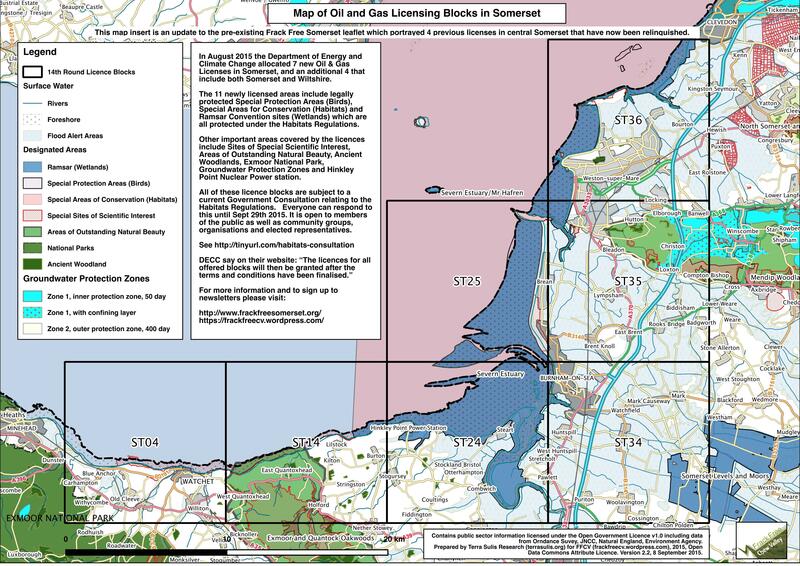 Somerset and Wiltshire licences were released in the 2nd tranche and confirmed by the Oil and Gas Authority on 17 December 2015. A company called South Western Energy Ltd. now holds the licences, which are known as PEDL’s – Petroleum Exploration Development Licenses. South Western Energy is not authorised to explore or produce, oil or gas, (hydrocarbons,) until it has agreement from the relevant landowner and planning permission. The seven licences on the west coast of Somerset will need planning permission from either North Somerset Unitary Authority or Somerset County Council. 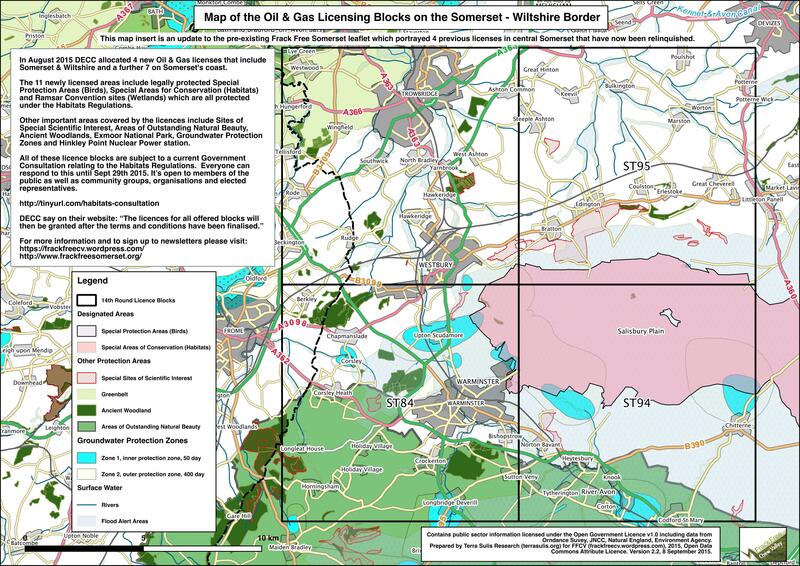 The 2 part licences to the east of Frome, will probably need joint permission from Somerset County Council and Wiltshire County Council as these licences are part of a group of four which adjoin the Wiltshire county boundary. The council which grants permission to drill or frack for oil and gas is known as the Minerals Planning Authority – MPA. You can right-click on the graphics to download a PNG (portable network graphics) format file. These maps are based on open information from the Government and its various agencies and are covered by the Open Government Licence. They are free to use, to print, to copy, to share – unless you are in the gas industry that is, in which case you should really go and make your own. They are designed for A4 size and if you want to print them then set your printer to high quality for best results. Many thanks to Frack Free Chew Valley for these images and text. Who’s got an oil and gas licence in your area?